Automated provisioning allows nodes to be configured without human intervention. By providing certain configuration values to the SwiftStack Controller, your nodes will be walked through the various steps of configuration without requiring you to access the web GUI and make choices manually. Currently, automated provisioning does not enable nodes nor initiate the first configuration push to the cluster. Support for automatically enabling nodes will be added in future releases. When a node is registered with the Controller, it will look for a file on disk at the location /etc/ssnode-claim.conf. If that file exists, it will read it and send the information therein along to the Controller. The Controller will then save this information and mark the node for automated provisioning. A node that is on the automated provisioning path may not be configured manually until automated provisioning has finished. The provisioning process will then proceed on the Controller, and after some time (no more than 10 minutes under normal circumstances) your node should be in its desired state. In order to create a Machine Profile, there must already exist a cluster to attach it to. Any Storage Policy you wish to assign drives to must exist before creating the Device Assignment Rules, and its index must be known. By default, each cluster contains a default storage policy called Standard-Replica with an index of 0. In order to execute automated provisioning on a node, the Region and Zone to which the node will be added must exist in the cluster's configuration. Optionally, the cluster should include Network Rules. If appropriate rules are not available, or fail to apply, the network interfaces will need to be set manually before enabling and pushing config to the node(s). Machine profiles are required to automatically ingest your nodes and are configured with device assignment rules that specify how storage devices on your nodes should be formatted and assigned to policies. To create a machine profile, go to your Organization page, and click the tab labeled Profiles. On this page you can manage machine profiles. 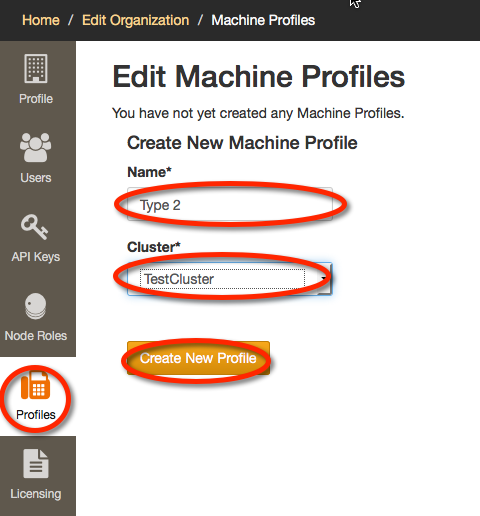 Choose a name and a cluster for your new machine profile, and click Create New Profile to create it. You will see a new table entry for your new machine profile. Click the Edit button. On the ensuing page, you will have a text area in which you can establish device assignment rules in a JSON format which is described below. You may prefer to first consult the example in the subsection after next before going back to read the more formal specification presented in the next subsection. The device assignment rules for a machine profile are specified in JSON as an array of objects, each of which represents a device assignment rules, in order of decreasing priority. predicates An array of device assignment predicates as objects, as described below. assignments An array of device assignments as objects, as described below. device_class A device class as an object, as described below. quantity The number of devices needed. policies An array of the integer storage policy indices that these devices should belong to, with the Account/Container policy represented as null. gb The approximate size of the drive as integer in gigabytes. tolerance A floating-point number indicating how close a drive's recorded size has to be to the gb attribute of this class in order for it to be considered a member of the class. If omitted, defaults to 2.0 GB. As you may have noticed, manually composing JSON to specify device assignment rules can be somewhat complex and error-prone. A more intuitive user interface for creating device rules will be incorporated in a future release. There are two ways to set a node up for automated provisioning. The first is to place the information in /etc/ssnode-claim.conf yourself. The second is to specify all the necessary information to the installation endpoint, which will then write it out to your filesystem. The information you can provide for automated provisioning follows. user_key The API Key of a user in your organization. The user this corresponds to must be authorized to ingest nodes. machine_profile The name of a Machine Profile in your organization to associate this node with. region The name of the Region to place this node in. Must be in the same cluster that the Machine Profile is associated with. zone The name of the Zone to place this node in. Must be in the Region specified above. You may wish to create a special account specifically for automated claim; that way, all your nodes in automated provisioning are associated with a unique service account, rather than one of your team members. The parameter user_key must be provided, and must be a valid API key for a user in your organization. If user_key is the only information provided, the node will simply be claimed to your organization automatically, but no further provisioning can be done. In order to ingest a node, the Controller needs three pieces of information: the node's Role, the Cluster to ingest it into, and what Zone/Region to place it in. If all of these parameters are provided, the node will also be ingested. Note that the Cluster is not provided directly but rather through the Machine Profile. Suppose you have the following set up on your controller: a user with the API key 0000abcdef0000abcdef0000abcdef0000abcdef , the Node Role All Swift Services enabled, a Machine Profile named My Profile , and Zone 1 set up in Region 1 . Then, when the Node Agent is installed, the node will be automatically claimed, then ingested into the cluster the Machine Profile is associated with, in Zone 1, with the role All Swift Services. Remember that this process will take some time.